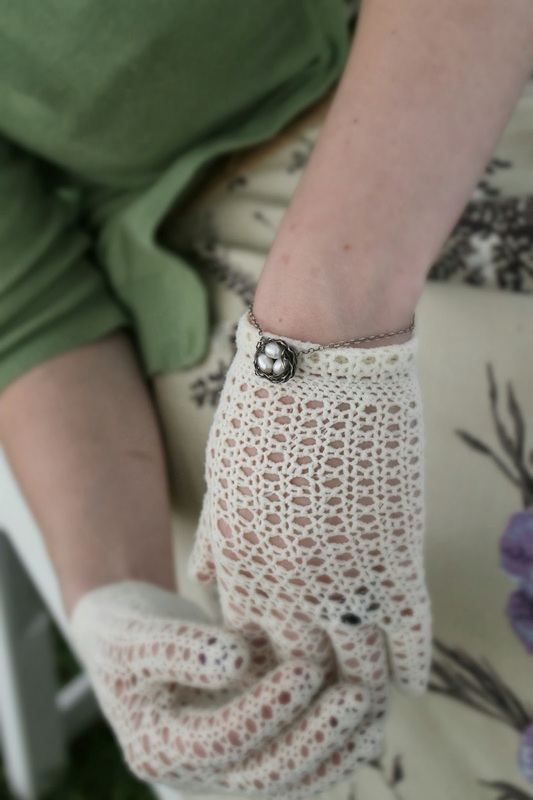 This weekend I attended a close friend's beautiful vintage themed wedding. From the mis-matched vintage china and crystal water goblets to the hand painted bird-themed tables and s'mores bar, this outdoor wedding was simply lovely. As a bridesmaid, we were asked to find large print floral dresses and, of course, being a lover of the 1950s I had to go with one from that era. 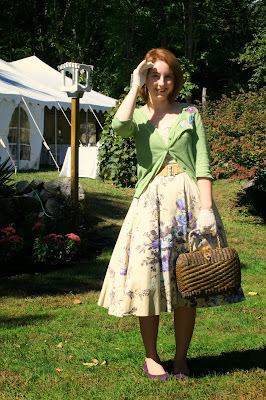 In the spring I found a dress I loved at the Vintage Textile Expo in Sturbridge and snapped it up. I decided to accent the dress with some 1950s accessories and finished off with some modern purple suede wedges and a cardigan. All the gals wore cardigans for the chilly morning - it was a cute look! The sun was out despite a rainy forecast and the backyard was beautiful and green. 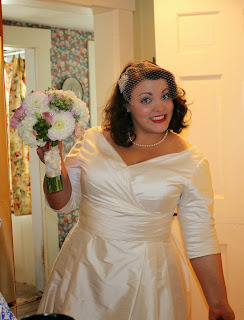 The bride was a total 1950s doll. Some creamy crochet gloves and a once-necklace that broke and was made into a necklace. Fit nicely with the bird theme. Each table had a bird theme. You matched your name cards up with the bird on your table. The birds were even hand painted by the bride's talented mother. The bride's flowers were lovely. Crystal flowers were worked into the bouquet and the bride wrote her vows on a monogrammed handkerchief in fabric marker - no crinkling paper and an emergency tissue for dabbing the eyes! So clever. The s'mores bar was a big hit. The blueberry infused vodka lemonade was a huge hit for cocktail hour! Aj and I tore up the dance floor! All in all a wonderful time with great company! 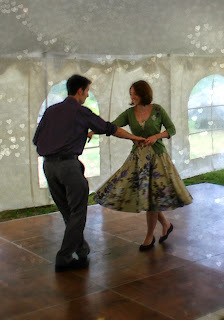 What a beautiful day Margaux and Brian had for their adorable wedding!